CoreLogic is currently tracking 1,936 capital city auctions this week, a fall from the 2,480 auctions that were held last week. Each individual capital city will host less auctions this week compared to last week, however compared to one year ago, there will be more auctions this week in Adelaide, Canberra, Melbourne and Sydney. The increase relative to last year is largely being driven by the more subdued auction markets last year given the following Monday was the Queen’s Birthday public holiday. As usual, Melbourne and Sydney are the two busiest capital city auction markets this week, with 941 and 671 auctions respectively, while another 319 auctions will be spread across Brisbane (119), Adelaide (97), Perth (26) and Canberra (77). Nine of the top 10 busiest individual suburbs for auctions this week are located in Melbourne, with one Sydney suburb (Mosman with 11 auctions) making the list. The busiest suburb is Glen Iris, with 17 auctions, followed by Epping and South Yarra, both with 15 auctions scheduled this week. Last week’s final auction clearance rate was 67.7 per cent across the capital cities, down from 68.9 per cent the previous week and representing two consecutive weeks of a decline in the auction clearance rate. Despite the broad based fall, three cities recorded a clearance rate above the 70 per cent mark last week, with Sydney (73.2 per cent) the strongest performer, followed by Melbourne (71.5 per cent) and Canberra (70.5 per cent). Last week’s result was the strongest result for Canberra since the last week in April. 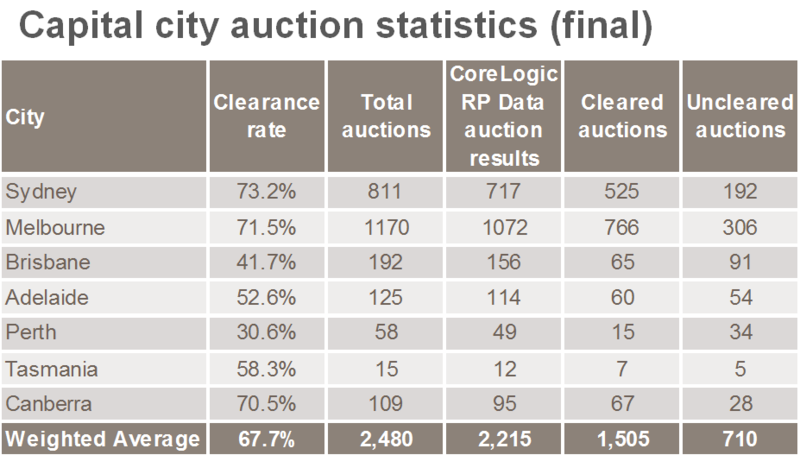 Across the individual sub-regions of both Melbourne and Sydney, the auction clearance rates were varied last week. For Melbourne, the strongest clearance rate was 79.2 per cent for the Outer East region, while the lowest clearance rate was recorded in South East Melbourne at 63.4 per cent. For Sydney, clearance rates ranged from 43.3 per cent in the South West sub-region to 89.1 per cent across the Eastern Suburbs. Outside of the capital cities, clearance rates fell on a week-on-week basis in all regions, with the biggest fall across Geelong, from 70.0 per cent the previous week to 54.6 per cent last week across just 22 results.